Lightweight kayaks are easy to carry, transport and get out on the water. You can also navigate waterways quickly, for a fun time kayaking. Also, the great thing about short and lightweight kayaks, is that you don’t have to buy fancy car racks to transport them! In this guide, we review top kayak brands like Sun Dolphin and Emotion Kayaks, all of who specialize in manufacturing the best lightweight kayaks. When considering which short or lightweight kayak you’re going to buy, it’s important to consider the size. The best weight for a lightweight kayak is under 45 pounds. It’s also best to ensure the kayak you choose is short enough. That way, you can handle it on your own. For some paddlers, this may mean a kayak that’s 10 feet or longer, especially if you’re particularly tall. For others, it may mean looking for a kayak between 8 and 10 feet. When buying a kayak, you’ll want to consider factors like the hull shape, comfort, storage, construction material, and more. 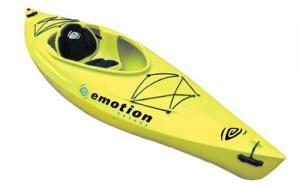 Emotion is well-known for making lightweight kayaks that are simple, but with handy additional features. The Glide is no exception, with plenty of options to make kayaking on ponds, lakes and slow-moving rivers enjoyable. For a smaller kayak, the smart hull design offers good tracking, with stability and maneuverability. To offer comfort while paddling, there’s a built-in CRS seat with a padded backrest and adjustable thigh pads. A heavy-duty adjustable foot brace adds to the experience. Storage on the Emotion Glide comes in the form of a tank well with net lacing. There’s also shock cord straps to keep your loose items safe. You won’t lose the paddle either, with a ledge lock paddle keeper for storage. As far as lightweight kayaks go, the Sun Dolphin Aruba 8 is both short and light. Therefore, if you’re just getting into recreational kayaking, this is a great option for you. This is a fairly basic model, so it’s very affordable if you’re on a budget. That doesn’t mean it’s not great value though, with a range of good features. 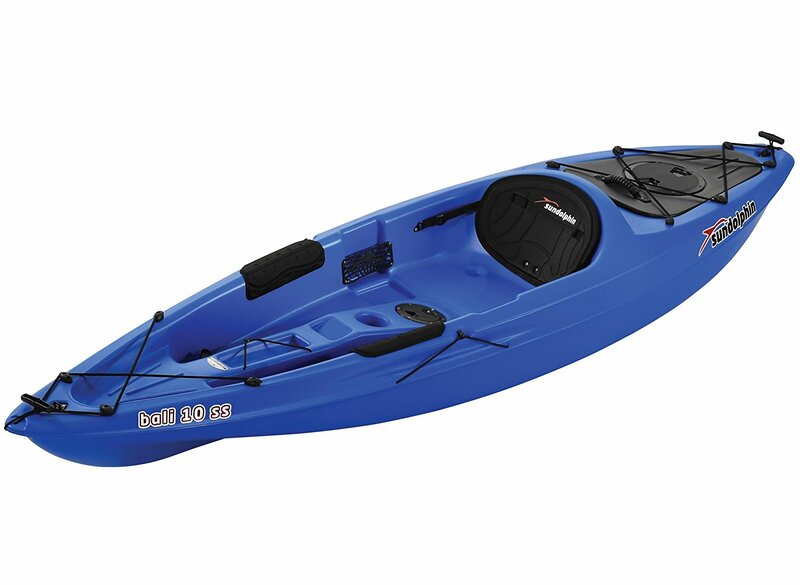 With a large, open cockpit, this is an easy kayak to get into and out of, making it a great choice for beginners. The Aruba 8 comes with a padded seat for comfort. It’s also adjustable, so you can find the right fit for you and children. A molded paddle holder ensures you lower the risk of having to chase after runaway paddles. In terms of storage, there are bungee cords on the front and a stern compartment to keep things dry. To get the Aruba 8 to and from the water is a breeze, due to it being among the easiest to carry of the lightweight kayaks. Old Town Canoes and Kayaks have developed a line of reasonably priced kayaks which are great for many activities. They lack a lot of bells and whistles, but they make up for it in their simplicity. The Heron 9XT has a beam of 28 ½ inches. This provides good stability in the water. It also measures 9 feet, 6 inches and weighs 39 pounds. 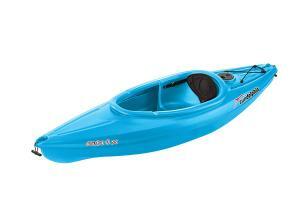 This is a decent sized kayak, great for many heights, but also is easy to transport to the water’s edge. In the cockpit, you’ll find all the basic features you need for a fun paddle on a lake or slow moving river. The seat is adjustable, as are the foot braces. These two features allow for many heights and shapes of kayakers to ensure maximum comfort. The kayak also has thigh pads which are adjustable. This is an excellent feature, as it can really support those with long legs. For storage, the Heron 9XT has one small compartment in the stern of the kayak. This compartment does seal shut and is waterproof. Though there’s not a lot of room for storage on the Heron 9XT, you are guaranteed that your items will be safe. The Sun Dolphin Bali SS 10 foot is easily one of the best lightweight kayaks on the market and, other than the extra length, it’s quite similar to the Sun Dolphin Aruba. Sit-on-top kayaks mean you can escape easily if your kayak tips, so they’re great for beginners as well. The Sun Dolphin Bali SS 10-Foot is the heaviest kayak on this list, but for good reason. It has a few extra perks which may make the extra weight worth it. Inside the open cockpit, you’ll find adjustable foot braces and an adjustable seat. 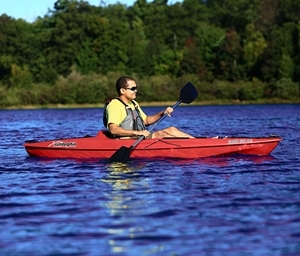 As with the other kayaks on this list, the adjustable features allow paddlers of any size to enjoy this kayak. There are also thigh pads and knee pads, which are fairly common features for Sun Dolphin kayaks. Keep in mind, these pads are not adjustable. Storage is what ultimately sets the Sun Dolphin kayaks apart from other brands. There are cup holders and electronics holders in the seating area, but there is also a PAC in the rear of the kayak. PAC stands for Portable Accessory Carrier. This little PAC can pop out of the storage compartment in the back of the kayak, leaving you with a decent sized day well. You can then use the PAC as a tow behind, a backpack, or a waterproof storage compartment which can sit next to you in the cockpit. The Stinger 3 is a pleasant, 9 foot 1-inch inflatable kayak. Many kayakers enjoy inflatable kayaks because you can store them in the back of your vehicle. 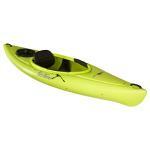 This allows you to pull it out and use it without having to plan on hauling a full-sized kayak with you. Plus, this kayak only weighs 25 pounds, so it’s one of the lightest, of lightweight kayaks. Not only that, but the storage bag it comes with is actually a backpack. This makes it extremely easy for solo kayakers to hike down to the water’s edge and set up the kayak on their own. The material this lightweight kayak is made out of is 3 layer PVC. It also has multiple air chambers. This sounds confusing, but means that if one part of the kayak deflates, the entire kayak won’t. Therefore, you’ll avoid sinking! There is a valve and also a foot pump to inflate this kayak. The foot pump is an excellent feature because you don’t need to get down on your hands and knees to inflate it. With a beam of 30 inches, this kayak will stay very stable in the water. Not only that, but it also comes with a paddle and an inflatable seat. These two features save you a little bit of money and provide extra comfort. You can also install two fins on this kayak if you’re concerned about the yak’s ability to maneuver. When you’re purchasing a short, lightweight kayak, it’s important to ensure it offers features which allow you to enjoy your favorite kayaking activities. This may be fishing or it may be paddling around your local lake. If you’re considering a short and lightweight kayak because you plan on solo kayaking, make sure the kayak is under 45 pounds and under 10 feet in length. This should allow you to carry the kayak on your own. If you’re choosing a short and lightweight kayak because you don’t have much room in terms of storage, measure the space you do have and ensure your kayak fits in the space. Weight may not matter as much if you’re choosing the kayak for this reason. When you want fast kayaking abilities, make sure that the beam is narrow enough, so you’re able to reach the speeds you wan tot. 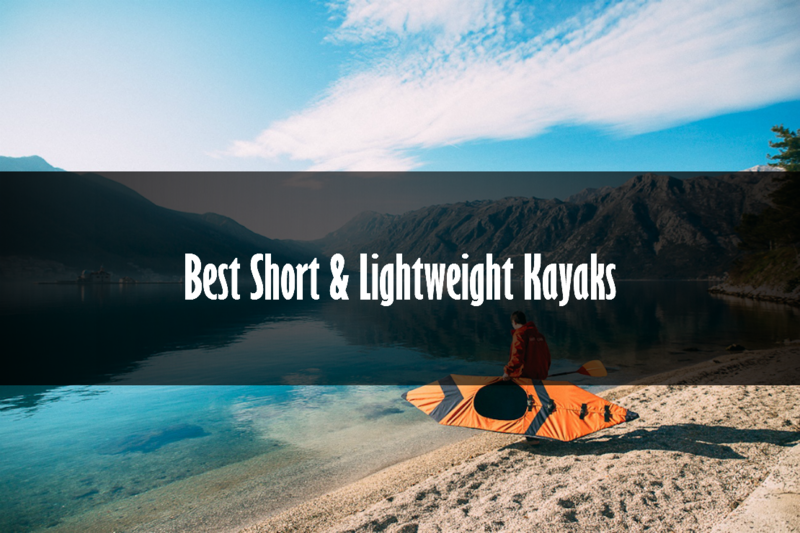 So, why choose a short instead of a long kayak? Long kayaks are traditionally used in ocean scenarios. The longer length on these kayaks allow ocean kayakers an easier time handling waves or strong ocean currents. Another reason longer kayaks may be used is for kayakers who hope to build up a lot of speed. These kayaks will also have a very narrow beam, possibly under 24 inches. For those who are exceptionally tall, they often assume a long kayak will afford them better options. Short kayaks are designed to be more compact. Often they have less storage and are meant for shorter trips, though this is not always true. The best short kayaks are also normally designed to handle rapids well. As previously stated, many tall kayakers tend to believe a long kayak will be better for their height. However, the short kayaks can be just as comfortable. It truly depends on the cockpit size of the kayak, not on the length of the kayak. It’s a good idea to find the measurements of the cockpit on the kayak you’re considering purchasing. Then, measure your own legs to ensure you’ll fit properly and be comfortable. Choosing a heavy or lightweight kayak can be even more confusing. There are strong advantages to each, but let’s start with the basics. If you’re the type of kayaker who sees a lake while out driving and stop to check it out in your kayak, a heavy kayak is not the best option. Heavy kayaks are often very difficult to take down to the water’s edge. However, if you know without a doubt you will always have a kayaking partner, the weight may not matter as much as you can tag team carrying your kayaks. Heavy kayaks have the added benefit of being more stable in the water. Their weight simply allows them to withstand tough waves. Conversely, if the kayak does tip, you will then have a more difficult time flipping the kayak. Lightweight kayaks may tip more easily, but they also provide less resistance which allows them to build up speed more quickly and maneuver easily in the water. Speaking of less resistance, the lightweight kayaks are especially beneficial for smaller kayakers, as they are easier to maneuver. Beam width is another tricky issue for kayakers. If you choose a beam which is too wide, your kayak will be difficult to maneuver. If you choose a beam which is too narrow, your kayak will not be as stable in the water. First, let us examine what makes a beam too wide versus too narrow. For an acceptable beam for a beginner kayaker, you want to choose one somewhere between 26 and 30 inches. This provides adequate support in the water without creating too much friction. For a more advanced kayaker, you may choose a beam of over 30 inches if you want to ensure that your kayak will stay steady. This is especially true for anglers, photographers, or hunters who need to move a bit and be hands-free. The Sun Dolphin Bali SS 10 is easily the best short kayak for anglers. Keep in mind, a kayak with this beam width will not be able to move quickly. On the other hand, an advanced paddler could also choose a beam of under 26 inches. This becomes much more challenging because the kayak is not nearly as stable in the water. However, the kayak is much more capable of gaining intense speeds, for racing or just the fun of picking up some serious speed! Inflatable kayaks are heavily debated in the kayaking world. They have the benefit of being much easier to travel with, but they can also spring leaks and are often not as sturdy. Since inflatable kayaks deflate and fold into a very small size, this means you can always have it on hand when the desire to kayak strikes. Likewise, if you live in a small home or apartment, you may not be able to store your kayak easily. Keeping an inflatable kayak may be your best option. Leaks are the biggest concern. When a kayak is made of a fabric, the smallest twig or other obstacle could perforate it. The kayak could also deflate simply from being used so often. It’s wise to purchase an inflatable kayak with multiple air chambers and to invest in a coast guard -rated patch kit. If you’ve been kayaking for many years, keep in mind that inflatable kayaks have come a long way over the last ten years and they’re much more difficult to perforate now. Finally, since the kayak is made mainly of fabric, they often do not maintain a solid shape. The solidity of polyethylene kayaks is what helps the kayak stay afloat and makes tracking and maneuverability easy. When purchasing any inflatable kayak, read about its rigidity. If it’s not listed as being very rigid when inflated, consider whether you can add a rudder to the kayak. A rudder helps with steering. Even though you have narrowed your kayak choice down to a short and lightweight kayak, you still have quite a few choices to make. Make sure you know which features are best for you and your loved ones before purchasing a kayak. 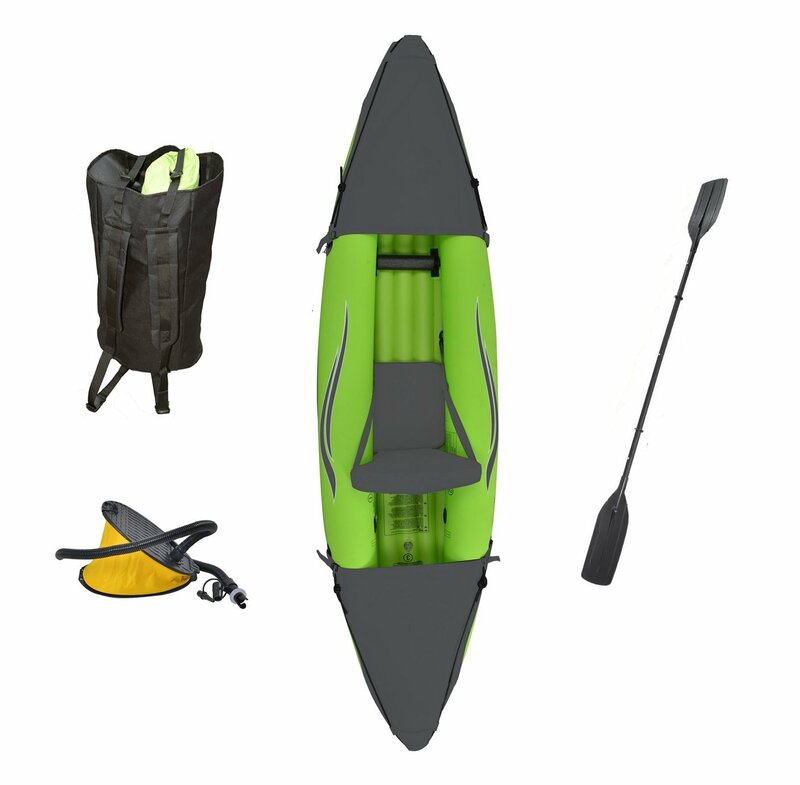 We believe the Emotion Glide Sports Kayak is light, sturdy, and packed with features. With a folding seat and adjustable foot braces, it has a lot of what most paddlers are looking for. Each of the kayaks on this list is under 10 feet in length and 45 pounds in weight. This should afford you the best possible experience while kayaking, so you can enjoy yourself out on the water.